Spring is my favourite time of year. The snow has finally melted and we get to enjoy longer periods of sunshine. It puts me in the mood to make everything fresh and clean. Normally, we associate spring cleaning with the inside of our home. I have my spring calendar set to accomplish all those indoor cleaning tasks. One thing we might not think of right away is the outside of our home. We should also get our yards into tiptop shape and clean up the results of a destructive winter climate. Preparing my yard for spring is a big action item on my cleaning to-do list. I’ve broken it down into easy tasks so the process doesn’t feel too overwhelming. My yard needs some major TLC and is looking pretty sad right now. By the time I’m done with it, I know it will be a different story. 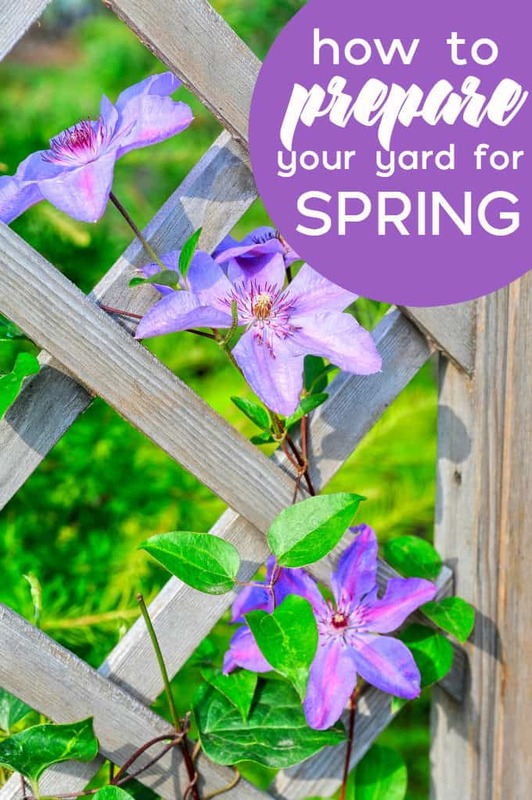 Join me in getting your yard ready for the season ahead! 1. Clean up debris. If your yard is anything like mine, it will have trash and twigs strewn throughout. I walk around my yard with a garbage bag and pick up anything that shouldn’t be there and either throw it out or put it in the compost bin. Like anything, it’s easier to start to clean when you have a blank slate to work with. 2. Clean outdoor furniture. Bring your furniture out of storage and give it a quick clean to get rid of any dust or dirt that has accumulated over the winter. I left mine outside all winter (eek!) so I’ve got my work cut out for me. For more ideas, check out these backyard and patio ideas for spring. 3. Clear walkway. Typically, this process involves me getting on my hands and knees and pulling out the weeds and rocks that have gathered in between my patio stones. It’s a yucky job, but someone needs to do it and it really makes a difference in the overall curb appeal of your home. 4. Trim trees and hedges. Do a walk around in your yard with your clippers and snip off any stray branches off trees or overgrown hedges. My neighbour came over last year with clippers and did the hedges on our side of the property so it is a must on my to-do list! 5. Decorate with hanging flowers or window planters. Adding a little pop of colour does wonders for the overall look and feel of your home. Visit your local nursery and buy some already grown flowers to add a little spring to your yard. 6. Fertilize and aerate your lawn. Set the foundation for lush, green grass that will last you all season and beyond. If you are the DIY type of person, you’ll want to fertilize and aerate your lawn. I recommend following these simple tips listed in the infographic below. 7. Bring in the professionals. If your lawn is in need of some major TLC and you don’t have the knowledge or time to fix it yourself, I recommend hiring a professional to bring it back to life. TruGreen has lawn care plans to take care of everything for you. They have a team of agronomic scientists who are familiar with the conditions in your area who can provide science-based solutions to give your lawn everything it needs to look its best. Visit TruGreen to find the best lawn care plan to suit your needs. Get a quote to find a plan to fit your budget and let the professionals take care of the rest. Save 10% on your first application when you purchase a tailored lawn plan. What are your tips for getting your yard ready for spring?